First time using Google Hangouts. Thought I'd make some notes. I had to do this in Firefox as Chrome has been very hard on my host the last month or so (don't know why, it just crashes it). Attempted to join meeting in Google Calendar. This took me to a new tab. Selecting previously unselected package google-talkplugin. After a short time, it recognized it was installed and put the tab into a black mode. 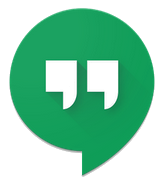 I saw a bubble saying, "Select 'Allow' for both Google Talk plugings in order to access the video call. See detailed instructions"
I clicked Allow in the upper right corner of the browser tab. Then it gave me some other confirmation dialog that went away as I was clicking outside the browser.